This bag design is a vast improvement upon the Regular Chips packaging. The flavor color coding at the tear ends is good placement, although the large white background is uninspiring. The logo is small, and has been smartened up with some color. While there seems to be a strange obsession with Chips manufacturers for putting the Kettle cooking style in Italic lettering, at least the flavor is prominent below it. The Chips and flavor bottle, pot, whatever, is also a familiar sight. Although there is nothing original about the Kettle Classics packaging design, at least it is a little more up to date. These Kettle Cooked Chips had a relatively meaty but soft crunch for Chips of this style. In the first instance they had a hard, crispy snap, which decreased in solidity as the munch went on. A good balance of more crispy than Regular Chips and less meaty than a Ridged Chip. If you were to design the ideal Potato Chip they would look something like these. The bag included random shapes, with most medium sized. There was some visible skin on a few edges. There were oil bubbles, but not entirely covering the surface of the Chips. They looked plain and rather uninspiring, but a good example of a solid performer. A Nose Plunge Test revealed a mild Vinegar aroma. Having reviewed many of this variety, we would say that generally speaking, US Chips manufacturers tend to include an overwhelming amount of Vinegar in this flavor partnership. 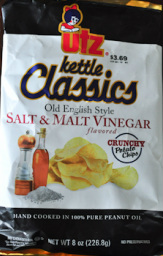 As Utz are brave enough to include that these are 'Old English Style' on the bag, we hoped that they would get the balance right. It is the second most popular flavor (after Cheese & Onion) in the UK, where it was invented to mimic the seasoning they add to Fish 'n' Chips. This was a case of close, but no cigar. The flavor balanced very well, but the creamy potato was possibly a little too prominent because something seemed to water the flavor down.